Earlier this month, we noted that developer builds of OS X 10.7.3 were showing evidence of AMD's forthcoming "Tahiti" graphics card family, the first to be built using 28-nanometer technology. The evidence suggested that Apple was at least preparing for the possibility of the cards being used in a Mac Pro update next year, an update that is reportedly still in question given uncertainty about the future of the line. In the wake of those findings, AMD today officially announced the high-end Radeon HD 7970 from the Tahiti line, billing it as the world's fastest single-chip graphics card. With the arrival of the AMD Radeon HD 7970, AMD has unleashed its revolutionary new Graphics Core Next Architecture that enables new levels of gaming and compute capabilities – realizing an improvement of over 150% in performance/sq mm over the prior generation. Engineered with support for PCI Express 3.0 and AMD CrossFire technology, the AMD Radeon HD 7970 graphics card arrives prepared for the next level of gaming. Engadget has a nice roundup of reviews of the new card, with testers generally reporting significantly improved performance over the current generation of equivalent AMD cards and other high-end competitors such as NVIDIA's GeForce GTX 580. On the negative side, reviews cited the card's $549 price tag and significant noise under high load. 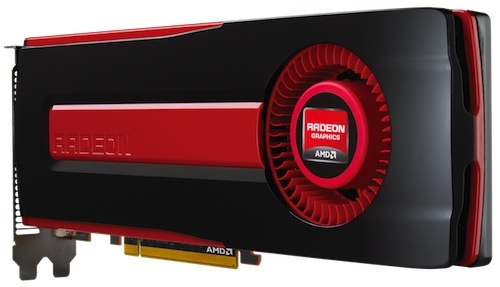 The Radeon HD 7970 will launch on January 9th, and AMD is also reported to be preparing to launch a slightly scaled-down model in the form of a Radeon HD 7950 card. With new Xeon processors from Intel launching in the first quarter of 2012 and AMD's new graphics card offerings lining up for a January launch, parts do appear to be coming together for a significant upgrade for the Mac Pro, which has not been updated since July 2010. What remains to be seen is whether Apple will continue to invest in its professional-level workstation line. Thunderbolt is not something to be added to a display card. It has to be attached to the motherboard chipset, since Thunderbolt is a PCI-Express lane. It might have DisplayPort, but no one has answered that yet. This thing is significantly faster than the 6970, and was just announced today. This is fantastic news! And shows how serious AMD is about the pro Mac market. In what way does it show that AMD is serious about the Mac Pros? They don't make these specifically for Apple you know. They don't even supply drivers for OSX. FYI: The AMD announcement makes no mention of OSX compatibility. Not sure why you're being voted down. But yes, I'm agree with you in case of a MacPro. Being updated on super super slow phase, MacPro is a dish served cold. It takes longer and longer for Apple to update the line. While something like Macbook Pro can get 2 updates (major & minor spec bump) in 2011. Even Macbook Air get updated in less than 1 year since 2010! It's only fair for Apple to keep MacPro line updated, even subtly. Why not silently including 6970 desktop GPU on 2011 MacPro? Keeping the same price tag for 2 years old hardware is just fishy. So yes, if I really need a "Pro" workstation today, I'd get a PC instead. Vote me down you blind fanboys!! To all those who seem to think Mac gamers are idiots: you should realize that many of us don't primarily buy our Mac for gaming. We buy it for general use, work, etc., and then do some gaming on the side. A lot of people aren't interested in Windows and wouldn't want to move to a PC just for gaming, and I don't blame them. I've got myself a base 2011 iMac and I game on it all the time in Windows 7. It's a great machine with a great form factor and an even better price. I'm saving to build my own gaming rig because I want MOAR POWA but it still does game well. How about anything would be an improvement right now. The HD 5000 Series is from 2009! It's just such a shame that Apple has given up any interest in offering normal consumers any computer in their range to take these things. It's either a giant laptop on a stand (iMac) with a mobile chipset, or a Mac Pro at the other extream outside most budgets, and at a price point no one will really develop mass market entertainment software to support, given it's price. I wonder if Apple will ever make a "Proper" home computer again like it used to? I hope they do as I'm sure it would sell really well. While I agree with your sentiment, I suspect most "normal" consumers never upgrade their graphics cards. I imagine they use their computers until they break or are no longer "fast enough" for whatever reason (not enough memory, spyware, viruses, graphics card, etc.). Then they just buy a new one. Remember, the fact that we're on this board suggests we're not normal consumers. As much as I would love a graphics card swappable iMac or iMac equivalent (or the much sought-after xMac), I suspect most users would never use the feature. At least, not enough to justify the inherent costs to Apple. The reference HD 7970 does have two Mini-DisplayPort outputs. I am sure you could place the Thunderbolt controller on the video card but that sounds like a pain to make a custom PCB and split the PCIe lanes onboard. Thunderbolt on the Mac Pro is probably the #2 subject of discussion after the new Sandy Bridge-E processors at #1. Sorry guys you can say how great your Mac is and how much better it is than a PC..... Nope, sorry, go to jail and don't pass go. Sure they're great for some things but when it comes to gaming it just can't hold a candle to a PC. PLUS why are all you guys running horrid windows on your mac? I always love when you talk crap about PC's yet mirror windows on your machine. IF it was so great you wouldn't need to run windows. Just saying. Sorry, but I never said Mac is better then a PC and I still like windows. I can have the best of many worlds. Gaming, boot to windows, video editing boot to Mac, development boot to Linux. Seems like a win/win/win situation to me.